The 24th session of the Universal Periodic Review (UPR) was held at the UN Human Rights Council, in Geneva, from 18-29 January 2016. Here is a recap of sexual rights at UPR24. Fourteen countries were reviewed during UPR24 including: Belgium, Denmark, Estonia, Latvia, Mozambique, Namibia, Niger, Palau, Paraguay, Seychelles, Sierra Leone, Singapore, Solomon Islands and Somalia. The UPR outcome for each State reviewed during UPR24 will be adopted at the 32nd session of the HRC from June 13th to July 1st 2016. The outcome report indicates which recommendations the State agrees to implement, and its responses to other recommendations. This is the only opportunity for civil society to make an oral statement during the official UPR process. The SRI, in collaboration with partners and allies, will work to ensure that sexual and reproductive rights are visible during this segment of the UPR process. Below are some highlights from each UPR24 review. Click here for the full list of recommendations made related to sexual rights, including State responses to date. 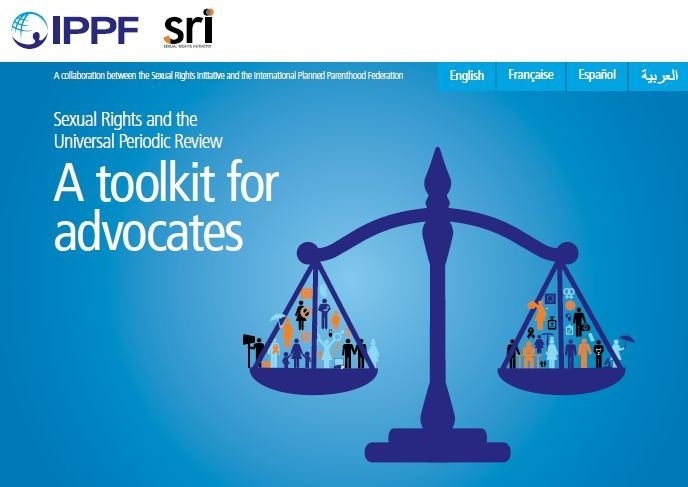 UPR Toolkit for Sexual Rights AdvocatesAvailable inEnglish, French, Portuguese, Spanish & Arabic.